The semitropical fig tree survives winter minimum temperatures of 15 to 20 degrees F when mature. Hardy fig varieties like the brown turkey fig survive even colder temperatures, but need extra care if planted outside their usual hardiness zones. Grown for delicious fresh fruit in locations as varied as Texas, Arizona and Hawaii, the brown turkey fig also adapts well to containers. Determined growers use many tricks to coax a crop from these stubborn trees where the fig won't survive naturally. Select a well-drained planting site with full sun and protection from winter winds. In areas with an average winter minimum of 15 degrees F, cold snaps drive temperatures even lower. Windbreaks, south-facing slopes or the south sides of buildings help figs survive with minimal damage. Don't plant in low areas where cold air lingers. Plant new brown turkey figs outside after the last frost. Set bare rootstock 3 to 4 inches deeper than the plants grew in the nursery. Clip off 30 percent of the upper growth. Set figs grown in containers at the same level as in the pot and do not top-prune unless training to a bush form. Train figs to a bush shape where winter damage is likely. Cut back tops after planting to half their original height to force side shoots. Cut all but three to eight strong shoots back to the ground during the first winter. Pick shoots with enough separation to allow growth to from 3 to 4 inches in diameter without crowding. Prune the tops back to 1 foot tall. 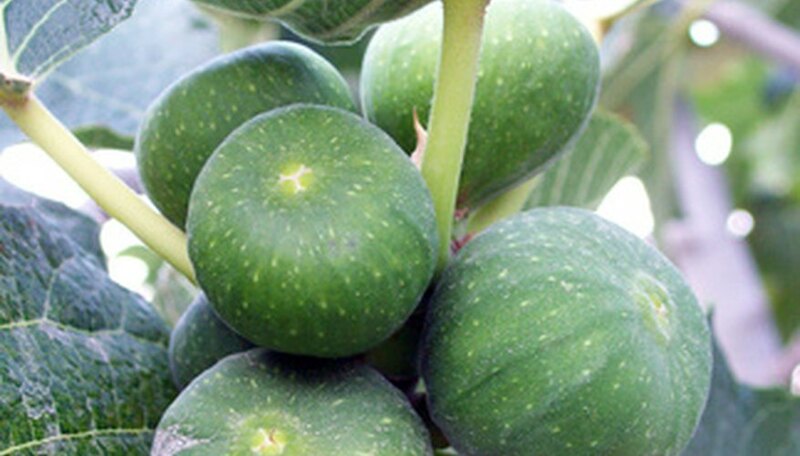 Cover brown turkey figs during severe cold snaps. Carefully bend branches to the ground and lay tarps over the top. Weigh down the edges of the cover with dirt or stones and add a 6-inch layer of airy mulch or straw. Cut back the annual growth after the brown turkey fig's second winter. Top-prune from 1/3 to 1/2 of the previous year's growth. Trim back to 1/2 inch before a bud or to the branch collar at the base of the limb to minimize dead wood. Trim out all dead and damaged wood each spring. Brown turkey figs sometimes die back to ground level from severe winter cold but healthy trees quickly regrow. Keep a 3-foot diameter space around new fig trees clear of grass and weeds. Don't plant fig trees within the root zones of established trees. Some growers bury the tree for the best winter protection. Sever roots on one side and dig a trench on the other. Bind limbs to the trunk and carefully push the tree over into the trench. Cover the entire fig plant with dirt until spring. If planting figs in an old garden or orchard, treat the soil with nematicide first. Nematodes could seriously stunt new trees. Repeated tilling sterilizes the ground naturally by exposing nematodes to sunlight. Mature fig trees could reach 30 feet in height with roots spreading three times the diameter of the canopy. Don't plant figs near septic systems or clay drainage pipes since roots could clog or shatter the plumbing.